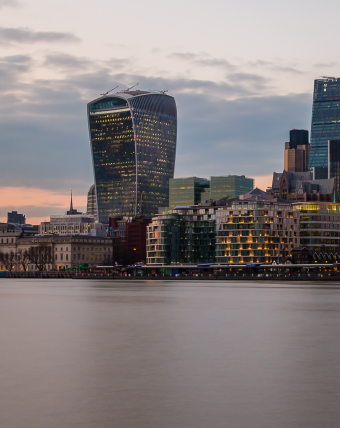 The 525-foot skyscraper at 20 Fenchurch Street in London, England earned the nickname “Walkie Talkie” thanks to its unique design. Slim at the bottom and wider at the top, locals could not help noticing its similarities to a handheld, two-way radio. However the Walkie Talkie also has another nickname- Walkie Scorchie. Construction began on the skyscraper in 2011 amidst controversy surrounding its appearance; it was complete enough for its first tenant to take up residence in May of 2014. Construction finished in August of that same year. However, long before completion, in September of 2013, the director of Moderna Contracts, Martin Lindsay, parked his car across the street from the south side of the Walkie Talkie building. His Jaguar XJ was in a parking space there for an hour or two before he returned to find the plastic mirror, Jaguar emblem, and other parts of his car had been melted by sunlight reflected from the Walkie Talkie. Certain businesses on the southern side of the skyscraper also sustained heat damage, including cracked tiles and singed carpets. One business owner even fried an egg and toasted a baguette in the light from the building. So what’s going on here? The south side of the Walkie Talkie curves into a concave shape, resulting in light reflected from a large area being concentrated into a small one. After paying to fix the damages done by their building, the owners of the Walkie Talkie installed a temporary sunshade in early 2014. This device consisted of a dark screen that prevented the reflected sunlight from causing damage. The permanent fix consisted of installing horizontal aluminum fins throughout the offending south side, which diminished the view a bit from inside the building, but also killed the “death ray”. As mentioned, this isn’t the only time world renowned architect Rafael Viñoly has dealt with the consequences of the Sun reflecting off one of his buildings. He designed the Vdara hotel in Las Vegas which similarly has a so-called “death ray” due to the concave shape. In this case, different areas on the pool deck get affected throughout the day. In one reported instance, hotel guest Bill Pintas had his hair singed while he was lounging by the pool and the “death ray” moved over him. He ran from the area as it began burning him and when he got back after the heat ray had moved on, a plastic bag holding a newspaper next to where he’d been sitting had partially melted, which he took a picture of for documentation. He was told by hotel workers nearby that they’d even seen disposable drink containers melt under the power of this reflection. While the Walkie Talkie no longer melts cars or sets fires, it continues to harass Londoners. Passersby and business owners report that the gusts of wind at the base are sometimes strong enough to knock people over. A food trolley on the street was nearly blown over at one point resulting in the owner having to put a warning sign on it after a health and safety auditor observed the extremely strong gusts at the base of the building affecting the trolley. As a result of all this, the head of design of the City of London Corporation, Gwyn Richards, began calling for independent studies of all new buildings to ensure that their designs would not cause similar issues. Why Do Skyscrapers Melt Things?